A blog from London gave Year of the Tiger their first write-up! Woo! I made a tumblr for the band here. If you follow there are prizes for you. But mostly me talking about being in a band and what that's like. Fun! I jumped up and down a lot and Mochi probably thinks I'm a total loon who is going to eat him soon, but he'll get over it! He is going through bunny puberty now so he's already on edge. He bit me with what I believe to be somewhat malicious intent for the first time the other day. It left a mark, look! 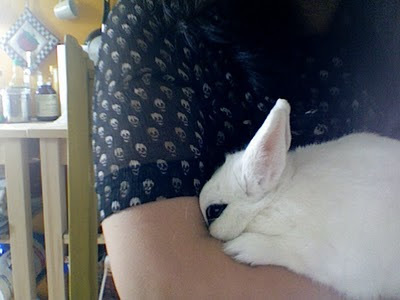 Stupid rabbit couldn't wrap his jaw around the flat plane that is my chest. Hah! Flat chest- 1. Mochi- 0. It did pinch though. Thus the red bump that I STILL have, 2 days after. I read that swabbing his glands will get rid of the musky odor rabbits emit when going through puberty. Let me tell you, taking a wet warm cotton ball to what looks like giant cahones on your wee little bunn is one of the creepiest things I've done to date. If his heavy breathing and twitching is any indication, I'm sure Mochi agreed. We both felt mutually violated.